Beauty Day, got the chores done by noon so it was time to open the range and "Make Smoke". I took the .45 CVA Kentucky out, using .45 swaged Balls and the Butler Creek Poly Patches (Ball Sabot) I bought a few years back. Today goal: confirm the consistency and accuracy of the powder/patch/ball at 25 yds and 50 yds. I'm shooting open sights (blade) using a barrel rest. The target paper gives me a 2" black square for Bull. 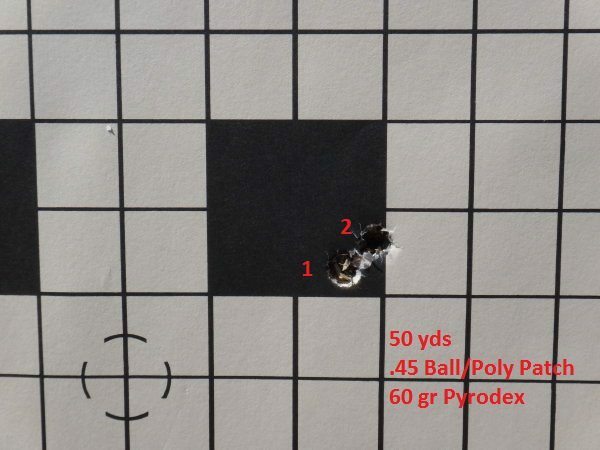 I should add, for those that don't shoot open sights, at 50 yds you don't see the black square, it's covered by the bead on the front sight so you're essentially shooting at an invisible target. Anyway, I'm pleased with the groupings for the first day out, surprised again how much more accurate for this gun got when I switched to the Poly Patches. A note of interest I didn't increase the powder charge and kept the same point of aim between the 25 and 50 yds distances. The drop was only about an inch, nice to know. Last edited by MikePal; April 23rd, 2018 at 04:22 AM. Last edited by MikePal; April 22nd, 2018 at 07:17 PM. Looks like it is shooting well. I have been thinking more about your first 2 shots at 50 yards vs 3, 4 and 5. Do you clean between shots? Might be worth trying, those first 2 are awesome then it starts to open up. I know this is a round ball at 50 yards but 1 and 2 vs 3-5, quite a bit further out in the group. quite a bit further out in the group. I don't think in the world of 'Patch and Ball' that 1" is considered 'quite a bit'.......LOL. That drift is just me, after shooting equivalent to x20 'slug' rounds that afternoon my shoulder was getting sore and as i said earlier,my heart rate was up from walking back and forth..not the best for accurate shooting. Last edited by MikePal; April 24th, 2018 at 07:09 AM. Thanks...yes I'm impressed that this gun can produce a tight grouping....I had a heck of a time trying to get any consistency with it when I first started shooting it using the lubricated patches. When I switched to these Poly Patches it sure tightened it up. That drift is just me, after shooting equivalent to 20 'slug' rounds that afternoon my shoulder was getting sore....LOL..
3 and 4 is a 3" spread, so 6 MOA, as I said before, I am not sure of round ball accuracy but was just wondering about cleaning, lots of people claim they need to swab the bore between shots and the long range black powder guys use hoses to blow into the bore to softening the fouling. Shot 1 and 2 are touching, is that just luck or is that what that 45 is actually capable of? I sighted in all the deer rifles on the same day last year, I know what it is like when things get sore, 8 rifles, 2 ended up being properly dialed in and the other 6 were close enough to stay in the cabinet for the week, the next day was rough. 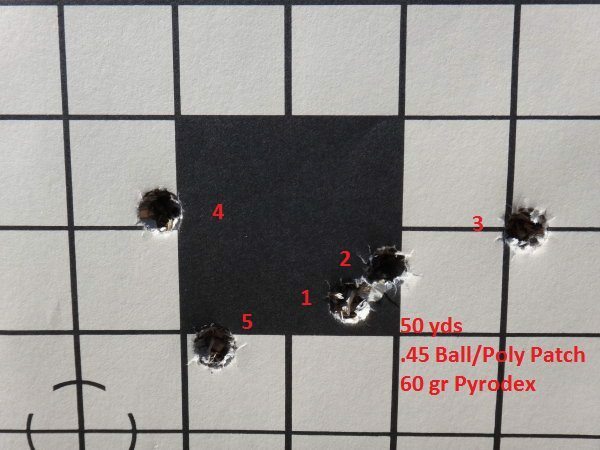 Ahhh starting to see the misunderstanding...the target is the 2" square...and 4/5 shots are touching it..that is good shooting in the world of Black Powder shooting with Patch and ball. 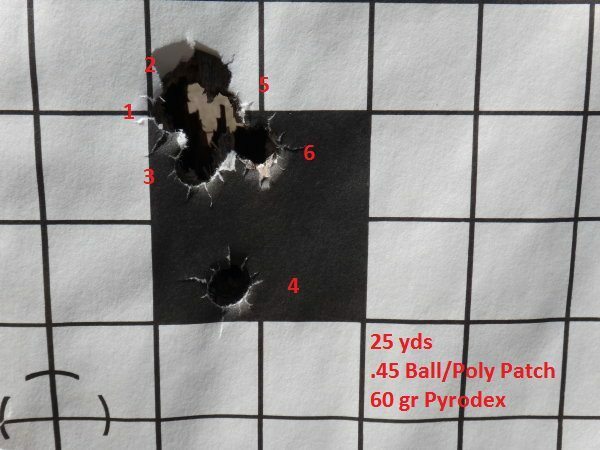 Well considering that 5/6 shots are touching at the 25yds range I can say, yes this gun, with these polypatches, is accurate enough, but you'd have to be able to see the target. As stated earlier, the 2" square is completely hidden behind the bead on the front forsight at 50yds.....so just hitting is the challenge. Last edited by MikePal; April 29th, 2018 at 05:52 AM.